The Parting of the Ways originally aired in 2005. Everything must come to dust. All things. Everything dies. The Time War ends. And so the first season of Russell T. Davies’ revived Doctor Who comes to a close. If you asked me, it’s the best season of the show that Davies has produced. The year contains a few clunkers, and it doesn’t contain the highest concentration of enjoyable episodes, but I think the first year has a much clearer direction and purpose than any of the years that followed. 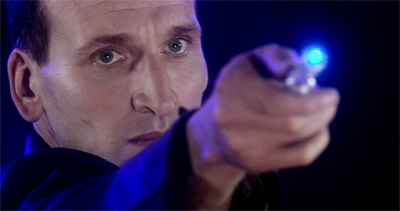 Although apparently Christopher Eccleston’s departure was only decided after the show went into production, the first season seems like it is constantly building to the death of the Doctor. The entire first season seems to build, logically and rationally, towards that moment. To be fair, Davies’ Doctor Who season finalés are all a bit awkwardly structured. They typically elevate the stakes impossibly, creating a situation that can only be resolved through the application of a handy deus ex machina. In a way, The Parting of the Ways is no different, but I tend to forgive its flaws a bit more easily than most, if only because Davies’ application of the handy reset button at least exacts a price from the ensemble. There’s a moment in each of Davies’ season finalés where the writer is tasked with putting the genie back in the bottle. 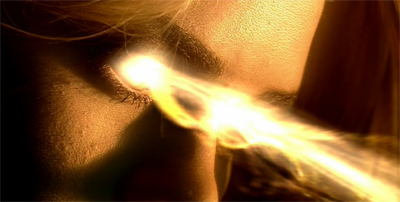 In Doomsday, it is as easy as hitting “reverse.” In The Last of the Time Lords, it consists of making the Doctor glow and return to normal so he can vanquish the Master. Truth be told, that is the most frustrating aspect of Davies’ take on Doctor Who – the sense that each season is building to a climax that will rely on some cheap narrative sleight-of-hand to tidy everything away. The Parting of the Ways, however, manages to avoid the worst of it. Of course, it still has that deus ex machina – quite literally in the form of the “heart of the TARDIS” that allows Rose to save the Doctor, kill the Daleks and resurrect Captain Jack. I do like that it was set up Boom Town, even if it was just as awkward a deus ex machina there as well. However, there are several things that distinguish this finalé from Davies’ other uses of an out-of-left-field reset button. The first – and most obvious – is that the reset button comes at a price. I think that’s what was most frustrating about the Doctor’s resurrection in The Last of the Time Lords. There was no penalty charged against any of the characters for the use of such a narrative cheat. Sure, Martha’s family had to live with what they had been through, but that was going to happen anyway. The Doctor was magically young again, the world was reset to the point before any of the Master’s insanity took place and there is no way that anybody involved in the story could have reasonably hoped for a better outcome. You could argue that the loss of Rose in Doomsday provided a cost to using the handy “reverse” gimmick that handily took care of all of the Daleks (and most of the Cybermen) that were invading London. Again, I’m not convinced that the price was high enough to justify the happy ending it bought. For all that Rose ended up separated from the Doctor, she got her father back and had a nice life. It’s hard to feel too sorry for Rose, given how many companions ended up with far less. In contrast, the “get out of jail free” card that Rose employs at the end of The Parting of the Ways effectively kills the Ninth Doctor. It’s still a very small price to pay for the fact that it wipes out all the Daleks, saves the universe and resurrects Captain Jack, but it is a sizeable loss. In a way, it seems like the Doctor’s decision to involve that Time Lords at the climax of The War Games. It resolves the problem at hand, but it also presents its own problems. Aside from the fact that it kills the Doctor, the narrative cheat also feels justified because it doesn’t seem to handily reset everything. It doesn’t seem to wash away the consequences of the Dalek attack on Earth, even if we’ll likely never see them again. It might have resurrected Jack, but there’s no indication that the millions of people dead on Earth have been revived, or even that those people who fought for the station have been restored. Davies’ finalés suffer because they feel a need to put almost everything back where it belongs. The Cybermen and the Daleks invade London in Doomsday, however the damage they do is minimal. Donna completely misses out on it by virtue of being out of the country. The Master spends a year occupying the Earth in The Last of the Time Lords, but Davies conveniently reverse everything so that it never happened. Well, except the bit where he killed the President of the United States, but more on that later. I can understand why Davies would have to reset those attacks. After all, if you set your stories in a present day world, then allowing plots like that to leave their mark on the planet would undermine it. Doctor Who is, after all, tea-time telly, and you lose a sense of relatability if Smith and Jones is set in a London that is still trying to identify the dead from an alien invasion or still trying to repair infrastructure. Imagine tuning into Partners in Crime and having to figure out why there are all these statues of John Simm being knocked down while the bodies pile up in the street. The Parting of the Ways is freed from these sorts of constraints by virtue of the fact that it is set in the (very) distant future. The Doctor won’t return there, so it’s okay to wipe out the majority of Earth’s population. We won’t ever see it again, so the Daleks can bomb Australia so hard that they change its shape. Okay, so it is a cop-out that Davies can all but completely destroy a world that we will never see again, but it is at least better than nothing. 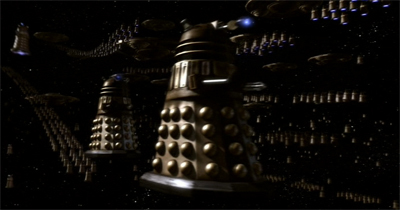 It means that the Dalek attack has some consequence, even if it’s never one that we’ll have to deal with. Which, handily enough, brings us to the best part of the episode. The Parting of the Ways might be the most thoughtful and clever examination of the relationship between the Doctor and the Daleks. The dialogue that runs through the episode between the Doctor and the God Emperor does an excellent job illustrating how the two play off one another so well, and just why the Doctor and the Daleks find themselves so alien to one another. Explaining the situation to the Doctor, the God Emperor observes, “We waited here in the dark space, damaged but rebuilding. Centuries passed, and we quietly infiltrated the systems of Earth, harvesting the waste of humanity. The prisoners, the refugees, the dispossessed. They all came to us. The bodies were filtered, pulped, sifted. The seed of the human race is perverted. Only one cell in a billion was fit to be nurtured.” This immediately contrasts the Daleks against the Doctor, in methods, objectives and philosophy. In contrast the the Daleks who skulked around in silence, the Doctor arrives noisily, declaring himself. He doesn’t “quietly infiltrate” anything, he loudly demolishes the system. He fights for “the prisoners, the refugees and the dispossessed”, representing those neglected or abused by the system – while the Daleks merely feed upon them. While the God Emperor believes that only “one cell in a billion” deserved attention, the Doctor is willing to believe the absolute best of anybody. And yet, despite that, there’s a hint of recognition between both the Doctor and the Daleks. Recognising the sacrifices that these Daleks have made in order to survive, the Doctor observes that these compromises have taken their toll. 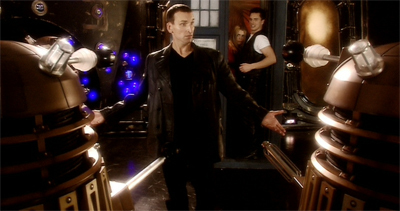 “You hate your own existence.” Of course, the Doctor knows a thing or two about having to compromise in order to survive, and it seems like the Ninth Doctor has spent his entire existence living in the shadow of the Time War, feeling responsible and guilty for the bloodshed, atrocities and genocides. There is a certain amount of self-loathing to be found in the Ninth Doctor, bubbling beneath the surface – it’s part of what makes him seem so much more vulnerable than most of his predecessors. So when he sees the Daleks are having their own difficulties with the price they paid in order to survive, there’s a hint that he can almost empathise with them. It’s actually handled with a great deal more subtlety than the comparisons made in Dalek, and I think that’s to Davies’ credit. Indeed, the Doctor’s central plotline in The Parting of the Ways sees him forced to confront the similarities between himself and the Daleks. In a way, it recreates the end of the Time War, with the Doctor forced into a situation where he must commit genocide in order to stop the Daleks. It wouldn’t be until The Satan Pit that we discover the Doctor had been forced to kill his own people, but it is very heavily implied here. It feels like a full circle for the Ninth Doctor, and the end of his character arc. That’s why the regeneration at the end of The Parting of the Ways works. Indeed, I’d hate to imagine what this episode might have looked like had Eccleston stayed on for a second year. We’ve never learned the particulars of the Time War, but it’s heavily implied that the Eighth Doctor was the version of the character who who eventually pulled the trigger and ended the conflict at the cost of countless lives. In doing so, it seemed, he forced his own regeneration. 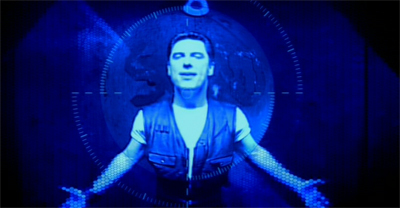 The Ninth Doctor was born with blood on his hands, and a lot of his actions throughout the season are governed by that simple fact. On his first trip with Rose, he took her to watch her world die in The End of the World. On the next adventure, the Gelth exploited his survivor’s guilt to trick him into building them a bridgehead. The Parting of the Ways is the ultimate expression of that, the Doctor dealing once and for all with the responsibility that he carries and deciding whether he will allow it to happen again. That’s why this is such a great Dalek episode. Sure, the Daleks are shown as a lot more menacing than they have been in a long time, and arguably more effective than they would be in any subsequent episode. However, The Parting of the Ways accepts their destruction of Earth as a foregone conclusion. There’s nothing the Doctor can do to save the planet below, which does a great deal to make them seem scary. More than that, though, the primary conflict between the Doctor and the Dalek isn’t one of wits or strength. It’s a philosophical conflict. What makes the Dalek threat so effective in The Parting of the Ways is the fact that the Daleks have a win-win situation. If the Doctor does nothing, they conquer the universe. That’s an easy win. However, if the Doctor stops them, they die – but they gain the moral victory. “You really want to think about this,” the Doctor warns them, “because if I activate the signal, every living creature dies.” The God Emperor responds, “I am immortal.” The Doctor calls his bluff, “Do you want to put that to the test?” And then the Dalek Emperor drops the bombshell, “I want to see you become like me.” No matter what the Doctor does, he loses. It helps that Davies’ interpretation of the Daleks here is the best they have been in ages. He reimagines a rogue Dalek nation manufactured from human flesh, one that has been driven insane by centuries of hiding in darkness. In that time, it seems, the Daleks have changed themselves. Terry Nation created the Daleks to stand in for fascists, and Davies stays relatively true to that that concept. However, he updates it significantly by adding one element to the mix: religion. Nation was inspired by the Nazis to create the Daleks with their eugenics and their ideals of racial purity. 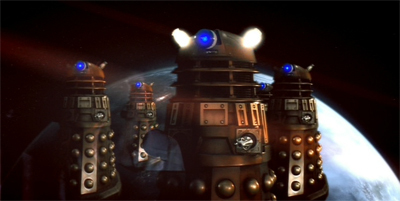 Here, the Daleks have become religious fanatics – hate-spewing monsters vindicated by their own sense of righteousness. Surviving the Doctor’s “inferno”, the Emperor has named himself God. 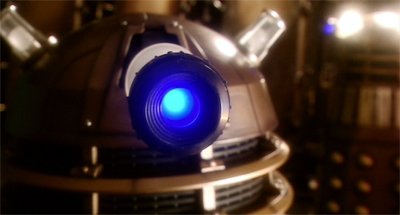 “Do not blaspheme!” the Daleks chant, one of the most disturbing moments of the revived series. It’s a bold moment because it seems at odds with decades of characterisation, but it works. I honestly think that this is the best thing that Davies ever did with the Daleks, and it’s a shame that any subsequent iteration of the monsters never really measured up. Then again, they next appeared in Army of Ghosts and Doomsday where they were overshadowed by the Cybermen. And then there was Daleks in Manhattan and Evolution of the Daleks, but we don’t talk about those. Still, it’s a shame that the best use the Daleks came in the first year of the show. The Doctor’s character arc is fairly good here, if only because Davies makes a bold choice with the character. It would be easy enough justify using the Delta Wave to wipe out the Daleks (and humanity), as the Doctor tries to do. However, Davies is brave enough to allow the character to stick to his principles even when the situation would make compromise so much easier. It’s a very interesting decision, and the Doctor’s willingness to classify himself as “coward” and to face his own extermination feels like a valid conclusion to the Ninth Doctor’s arc. 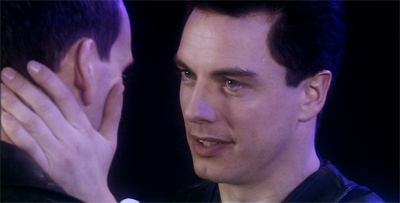 Of course, the use of Jack Harkness in the episode serves to vindicate the Doctor somewhat. I like the idea of Jack as a companion, even if he was somewhat underused – only joining the TARDIS for three adventures. It’s nice to have a companion who actively contrasts with the Doctor. 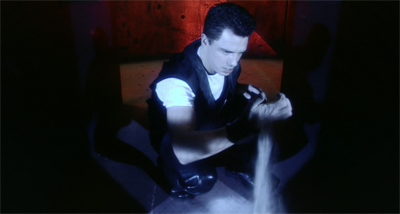 While the Ninth Doctor is an introverted pacifist, Jack Harkness is an extroverted pragmatist. While the Doctor can’t bring himself to kill everybody on Earth, Jack is willing to sacrifice everybody on the station to buy the Doctor a few minutes. If the Ninth Doctor is a coward, then Jack is a “killer.” he confirms as much when he laments the fact that the Doctor inspired him. “Wish I’d never met you, Doctor. I was much better off as a coward.” However, The Parting of the Ways makes it clear that Jack is not an unambiguously heroic figure. It’s heavily implied he lied to his recruits when he claimed that the “Bastic bullets” could “blow a Dalek wide open.” We discover – inevitably – that they can’t. Did he know beforehand? His goodbye to Rose implies that he knows he is giving his troops false hope. Indeed, one of his recruits even finds the energy to condemn him when her bullets don’t work. “You lied to me!” she yells, shortly before dying. There’s enough evidence to support the argument that Jack knew he was leading his soldiers to a slaughter and that he let them fight a battle he knew they’d lose. It’s not the kind of sacrifice that I can imagine the Ninth Doctor readily making, and it provides a contrast between the two opposing concepts. Jack is a “killer” willing to let others die in order to buy a few idle seconds. The Doctor is a “coward” who can’t bring himself to kill all the humans on Earth, even if it lets him wipe out the Daleks once and for all. Davies has spent so much of Bad Wolf and The Parting of the Ways deconstructing and criticising Doctor Who, that his vindication of the Doctor’s ideals carries a great deal of weight. And that’s the beauty of The Parting of the Ways. Davies has mounted a fairly effective criticism of the show in Bad Wolf. The Doctor has found himself attacked by contemporary television, and the episodic nature of his trips through time and space have come under legitimate scrutiny. In a very real way, all this is the Doctor’s fault. Davies does have a knack for subverting and undermining Doctor Who, which is one of the stronger aspects of his season finalés. However, having fairly effectively attacked the show’s weaknesses and having made some powerful and legitimate criticisms, The Parting of the Ways serves to vindicate the core ideals of Doctor Who. The Doctor’s moral integrity survives, even when confronted with these impossibilities and the harshest situation imaginable. The Doctor’s faith in humanity, as embodied by his relationship with Rose, ultimately saves the day. 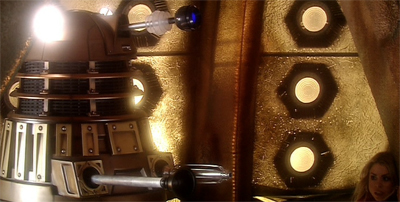 It’s no coincidence that the deus ex machina is hidden in “the heart of the TARDIS.” It’s also the heart of the show. I talked a bit about how Bad Wolf saw Doctor Who competing against modern television. In a way, the entire first season is an attempt to explore the challenges of updating the show for a modern audience. It’s no coincidence that Bad Wolf and The Parting of the Ways seem to borrow heavily from the Colin Baker and Sylvester McCoy eras of the show – the point where the competitive and changing television market almost killed Doctor Who. Only, of course, this time it’s the Daleks who are conspiring behind the scenes, not Michael Grade. You can imagine the insecurities eating at a young fan’s mind back in the late eighties. Let it go. It’s just a television show. It’s over. Nobody will remember it in a few years anyway. Something else will come along. You had a good run, right? 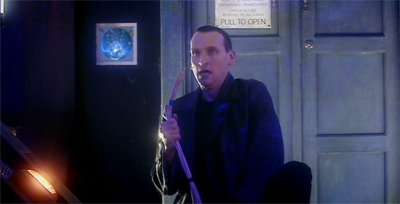 “Maybe it’s time,” the Doctor muses, as he’s confronted in the remains of a television studio. Things must have seemed pretty bad back then, and it was as impossible to imagine the show returning to television as it is to imagine the Ninth Doctor escaping the Daleks. And, in both instances, it’s an act of absolute commitment from a follower that brings them back and saves the day. The fans kept Doctor Who alive for years while it was off the air, and eventually brought it back to television. They did the impossible, much as Rose did. But, for those fans as much as for Rose, the show was worth saving. Despite all the criticisms that Davies has made in Bad Wolf and The Parting of the Ways, the central philosophy of the show deserves to endure. Indeed, The Parting of the Ways serves to close the book on the resurrection of the series, allowing the second season a relatively clean slate to do whatever it wants to do. Even the last, purest thread held over from Sylvester McCoy’s final season comes to pay off here. Rose is – in a lot of ways – a spiritual successor to Ace, the companion to the Seventh Doctor. However, while the show gave her a great deal of character development, it never really had a chance to pay off. It came close in The Curse of Fenric, but Ace never quite reached the point where she got to usurp the role of hero from the Doctor. Here, Rose gets to save the day, completing her journey from shop girl to universal hero. It’s a satisfying conclusion to Rose’s character arc over the past thirteen episodes, but it creates one sizeable problem for the next year of the show. Rose has effectively completed her development. Saving the Doctor and wiping out the Daleks is pretty much the high point of any companion’s character arc. Rose has really learned all she needs from the Doctor, and there’s nothing much else for her character to do. Which leads to my biggest problem with the second season – the fact that Rose has nowhere to go for most of it. 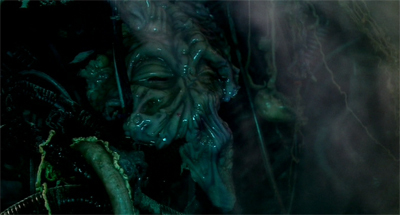 Part of that is due to the radical restructuring caused by Billy Piper’s decision to stay, but part of it is due to the fact that her character development really came to a halt in The Parting of the Ways, and we have to spend the year with a very smug and very arrogant companion who doesn’t play to the Tenth Doctor’s strengths. The idea of the Bad Wolf itself, paid off here, is an example of how Davies tends to do better with characters and themes than with plot. The basic idea is relatively sound – a message seeded through time and space from Rose to Rose. However, the connective tissue seems a bit weak. Moffat would have played with that idea a bit more, while Davies seems to include it hidden throughout the first season as a means of pointing to the first season finalé. The references could easily have been written long before Davies had any idea what the words actually meant and how they contributed to the arc. It feels clumsy. 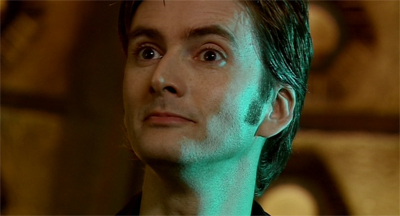 However, part of what’s really stunning about The Parting of the Ways is the fact that it is tightly plotted. 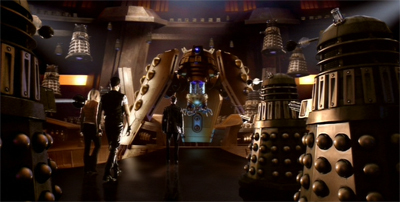 Bad Wolf only reveals the involvement of the Daleks at the climax, despite the fact that Boom Town included their “extermination” beam, so there’s a radical shift between the two halves of the two parter. And yet, despite that, Davies manages to get everything handled in forty-five minutes. It’s a surprisingly tight forty-five minutes of television, considering that Davies’ finalés tend to run a little over time, and Joe Aherne does an excellent job keeping it focused. The Parting of the Ways is easily the best finalé of the Davies era. I’d even describe it as the best Dalek episode of the new series. It seems a bit disingenuous to describe it as the best regeneration story of the new series, but I do think it is the second-best regeneration story of all the regeneration stories. 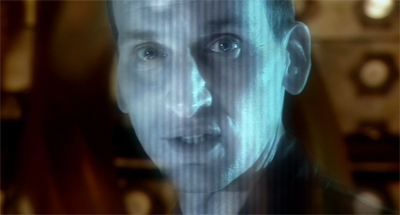 It’s damn fine piece of television, and a fitting conclusion to the Ninth Doctor’s tenure. – the Doctor. Right on.